DAILY DETOXIFICATION | BOWEL CLEANSING SUPPORT | HERBAL Blend -Daily Detoxification reduces toxicity that accumulates in your bowel. Your body is ‘potentially’ very toxic. Unless the majority of the food you eat is both ‘organic and raw’ you most likely fall into this category. Unfortunately, colonics are very harsh to the body. Your body is ‘potentially’ very toxic. Unless the majority of the food you eat is both ‘organic and raw’ you most likely fall into this category. Daily Detoxification may reduce toxicity that accumulates in your bowel and GI tract from consuming processed foods of any kind. Daily Detoxification is composed of a complete herbal blend that may support daily intestinal, liver, and colon cleansing and elimination. It is a mild herbal cleansing formula that is not a laxative. Remember, colonics are very harsh to the body. It's far better to keep the body in a detoxified state than to let it become toxic and be subjected to a harsh flush. Do you exist on a daily diet of fast foods? Do you eat food that has been cooked, boiled, or microwaved from processed or frozen packages? Are you chronically tired or suffer from toxicity? If you said yes to any of the above questions, then you may be ‘toxic’ internally. Toxicity in the G.I. tract is a major problem that can be a health reduction contributing factor in today’s society. Toxicity can result from the accumulation of undigested processed foods that we consume on a regular basis. Additionally, prescription drugs, antibiotics, as well as environmental hazards such as pollutants, chemicals, pesticides, and parasites can add to this problem. These factors are constantly attacking our bodies, making us susceptible to illness and disease. This very effective formula helps to rid the body of toxins by increasing the regularity of your bowel movements. By increasing the frequency of eliminations, your system has a chance to recover. Daily Detoxification provides a gentle cleansing from safe and effective herbs that promote a much healthier internal body environment. PROMOTES a cleaner, more pH balanced G.I. (gastrointestinal) system and bowel area. REDUCES toxicity that accumulates in the bowel and G.I. tract from consuming a processed food diet. SUPPLIES a complete herbal & high quality fiber blend to support daily intestinal cleansing and elimination. INCLUDES the most effective cleansing herbs available. DECREASES the time between bowel eliminations. This is so good to help me keep healthy. I have been using it for years. 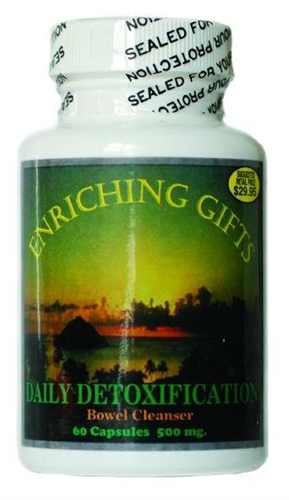 I first started using the Daily Detox product from Enriching Gifts when I was getting colon hydro therapy in conjunction with my cleanse supplements. My therapist would recommend taking a couple of pills at the end of the day or early morning to keep things moving (smile). Over time, we concluded that this product could work as a nice supplement in support of my daily life on a case by case basis. As part of my regular use and recommendation of the product to my wife she was very hesitant to take the supplement, but she has had problems with her stomach and regularity so I really pushed the product on her. Now I say she is addicted to it as the orders I place are largely for her benefit. Overall the product performs very consistently and we are both very pleased with the results and benefits. My use is 3 pills once or twice a week and my wife takes one pill daily. Enrich Gifts went above and beyond to send me product while I was on a business trip to my hotel for no extra shipping cost! That is refreshing.